I wrote a post about simplicity last week, and the next day had a conversation with a friend about spending and budgets, thoughtful purchasing, and the guilt and shame that can sometimes surround spending money, especially on ourselves. For me, this has always applied especially to clothes. I don't consider myself a fashionista. I've never had the money to be one anyway, and it simply isn't a priority for me. I don't care about trends. I have my own taste that's mostly unaffected by whatever is "in" at the given moment, I've always simply tried to wear what makes me feel good. For years, most of my wardrobe came from Target, sometimes Nordstrom with some Gap and American Eagle here and there. I very much appreciate good design and beautiful things, but felt like I couldn't afford to splurge on good quality items. Most of my purchases were pretty impulsive and unplanned. I had favorite items that I wore all the time, but many things sat in my closet rarely being used at all. And then there were the things that clearly were just of such poor quality—I found myself replacing tops with holes and pilling, or stretched-out jeans, far too often then should be necessary. As I began to dive more into the concept of simpler living, I frequently encountered the concept of capsule wardrobes, and of thoughtfully planned clothing collections built over time with pieces that are well-made, high quality, classic, and will last over many seasons and years. This was usually accompanied by talk of where clothing comes from and how it is produced. It turns out that cheap clothing usually comes at the cost of severe social injustice and environmental harm. There is an entire "slow fashion" movement focused on ethically made, high quality clothing. For some reason it has taken me a while, but I've finally begun heading in this direction. I'd like to share the experience here for anyone interested. Please note that I do not consider mine to be even close to a true capsule wardrobe. I've read that by definition that would consist of 30 or fewer items (including shoes and possibly even accessories). 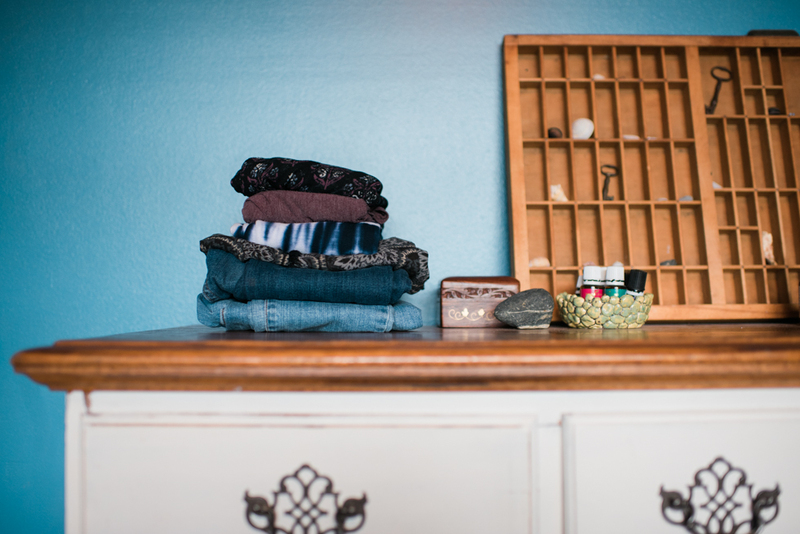 I'm not there, and I'm not sure that's even my goal, but I do want more simplicity in my clothing collection, as I believe it will streamline the process of getting dressed as well as eliminate clothing clutter and storage issues. First, during our big initial decluttering process, I rid my drawers and closet of everything unneeded. This included items that were stretched out, worn out, stained or torn beyond repair, as well as anything that simply didn't make me feel good wearing it. I tried on everything I hadn't worn in a while, and if there was just something off about it and I knew it was bound to sit unused for another six months, out it went. It's amazing how many things I kept holding on to with a "just in case" mentality (and that was the same all over my house, not only with clothes). After all of that , I was finally left with the things I actually wear, and actually like. From there, it's simply been a matter of identifying the holes in my collection or the pieces I'd like to eventually replace with a nicer, higher-quality version. And even the best-made things eventually wear out over time, so I plan to make replacements as needed. -4 pairs of jeans -3 pairs of soft, light "boho" style pants -3 pairs of shorts (2 denim, 1 soft printed) -10 tank tops (I wear tanks nearly every day, including for workouts and the beach and as a base layer under sheer tops. Most of mine are still the cheap ones from Target, but I'm gradually replacing them as they wear out, while also narrowing down to no more than 7. Everlane makes my favorites.) -5 basic t-shirts (and I just pre-ordered this one, which I'm pretty happy about!) -2 nicer tops that can dress up a little -4 tunic-type tank dresses, for pairing with jeans or leggings -2 other dresses- one floor-length black and one for looking somewhat professional when needed -4 skirts (which I don't wear much, but can't seem to part with) -4 (I think?) long-sleeved shirts -6 sweaters (3 cardigans, 3 pullovers) -1 winter jacket -Lounge and workout wear (I've probably got too many pairs of leggings, but I live in them at home, and for yoga, and also wear them under tunic-length items sometimes or as pajamas if I'm chilly. Versatile and so comfy. In this category is also a small handful of tops that I only wear for sleep.) -1 swim suit -Underthings (Nursing for the third time around meant new bras, as none of my old nursing bras were in any kind of usable condition when we pulled them down from the attic. I chose Cake Maternity, and they've been my favorite ones yet. I have 4 nursing bras that I rotate. Undies are pretty much all simple cotton, nearly all the exact same style in various shades of black, blue, and grey.) -Shoes: 9 pairs, which really still sounds like too many. My beloved Birkenstock sandals are my go-to, but they're getting older and I was feeling that they looked too grungy and casual for certain situations so after months of inner debate I purchased these from Olukai. These are well-made and comfortable, and will go with practically everything I wear. I wear sandals year-round, probably at least 80% of the time. I also have a pair of Teva flip-flops for the beach, to avoid messing up the leather of my other sandals. The other pairs consist of a pair of Toms casual sneakers, Merrel barefoot trail runners, regular Asics running shoes (which don't get out much these days, thanks to those Merrells! ), a pair of crocheted black Toms classics which are almost exclusively for shooting weddings, a pair of boots, and a pair of sparkly and awfully uncomfortable flats that I wear only for the very rare dressy occasion. Making that list was quite a bit more difficult than I'd expected, but I think that's pretty much everything. It may have been overkill to catalog my entire closet for you, but I think it's a good foundation for future posts on this topic. I would like to pare this down even a little more. I think I held onto some duplicates (especially tank tops and loungewear) because I was afraid of not having anything to wear in between laundry loads, but I've found that having fewer items to wash makes it pretty easy to wash more frequently. I'm getting into a habit of putting a load in each morning, and folding the one from the day before at some point during our morning school time. I've made a few purchases recently and feel that I won't need anything new at least until after the summer. - I mentioned the "Wild + Free Mama" tee above, which is from my favorite homeschool inspiration source. - I also just bought a pair of light-wash cropped jeans (see photo) from Nordstrom's Treasure&Bond line. I honestly wish I'd sought out a brand that is more focused on ethical production, but I did like that at least a portion of proceeds is given to charities. Here's a list of more ethical jeans brands that I'm curious about for the future. - And finally, my new sandals (see above)—Olukai has an outstanding commitment to the environment and their community in Hawaii.